Let's think about the nature of evil in the context of science some more. Specifically, an Augustinean perfectability impulse confronted by a malicious, anti-progressive Manichean enemy, an active agent which wants to replace the best available understanding with something less: Lysenkoists, creationists, climate change denialists. What does it look like when they succeed? It depends. In a totalitarian state, of course, the official doctrine dominates the scientific one wherever they diverge. We saw this in the Nazi discounting of Einstein's work and in the Stalinist's corruption of evolutionary theory with Lysenkoism. In a democracy, the goals of malicious pseudo-science are different. The sowing of doubt about important results that people are otherwise already predisposed to disbelieve is the goal. In that case, the objective is not to replace science, but simply to present an appearance of a scientific alternative. Let's revisit the graphic I came up with, illustrating some aspects of the state of debate in climate science, and see if we can spot the stigmata of malice. Here we are factoring out policy ("business as usual", meaning the only constraints on carbon use are supply and demand, and that therefore fossil fuels will remain in use for a long time) and simplifying impact to a qualitative measure of good, indifferent, and various stripes of bad. The curve is a probability density; the population is "informed opinion", by which we mean something like "people with Ph.D.'s who have spent more than 6 months full time equivalent on the subject", so the vertical axis is reasonably well defined. I admit that the horizontal axis is mathematically problematic; you can't call it a linear scale but it's obviously not logarithmic either. So the graphic can only be qualitiative in nature. Now the image is purely a schematic. It isn't social science, and though I imagine it could be put to the test in a formal study it might be difficult to refine the design enough to really identify the two populations. In short this isn't a formal claim, it is a schematic. Still I think it captures something of how the situation is structured and at least part of why the public's position is so extremely out of tune with that of the expert community. So what does this two hump structure mean? If there were no malice involved, a two-humped opinion spectrum would mean there is an alternative theory, either ascendant or in decline, to the mainstream. There would be, in such a case, no consensus. But in the present case, we discover to our astonishment that the much broader mainstream hump has a much more coherent set of beliefs about how the system works. It is the narrower, smaller hump thaty contains a vast plethora of competing hypotheses. That is to say, the smaller hump doesn;t represent a position, but simply the union of a very large array of positions agreed on only one thing. "Not the IPCC. Very not the IPCC." This article isn't the place to discuss all the debating tricks and so on used to prop up the left hump and its prominence in the public debate. What I propose to say here is that when you actually look at this, it become too much to attribute the peculiar hump to pure chance acting on people acting in good faith. This sort of evil requires some sort of agency, if only an implicit and half-conscious conspiracy. Steve Easterbrook is a very nice man, and he has tried to convince me that there need be no malice whatsoever involved. And I;m sure we can find other scientific questions where the relevant population is clustered rather than continuous. The trouble is that it works out all too conveniently. If it were merely denial, it wouldn;t have well-funded conferences. This is not to say that everyone or even most of the people in the left hump have malign intent (and pleasant social skills, as often they do). Very few conscious agents are required given that the truths of the right hump are indeed somewhat inconvenient. I just question whether the left hump could exist in the absence of evil. How can we protect society from this sort of scientific charade? That's the gigantic, crucial one. Without reliable communication channels between science and society, any modern society has a very poor prognosis. One key message in this oft-misinterpreted article is that the vast majority of professional opinion concurs with the highly coherent conceptual framework presented by IPCC WGI, even though that represents a wide spectrum of impact assessment. The bulk of the opposition is concentrated in a narrow spectrum of impact assessment (specifically, so near zero for CO2 emissions as to require no policy change), but they lack a coherent conceptual framework and tend to just snipe from various angles. Therefore it is legitimate to conclude that a consensus exists, not on impacts, but on the underlying physical phenomenology. It is to this physics-based understanding with which the thirteen leading national academies, the AAAS, the AGU, the American Meteorological Society, the APS, the ACS, the EGU, etc. etc. have expressed concurrence. If that’s not a consensus then I am pretty baffled as to what is. Saaaaay....that sounds pretty much exactly like what I said about Tom Fuller. Only pretty much not Dano-like. Malice. Yes. Bad faith. Yes. How did it go with tobacco? I think proving lying is not enough. There needs to be profit to make it a fraud. Speaking as a mop (member of public) with a wide interest but little specialised knowledge about this sociology stuff. The first question segues into the second, so I'll take them in rough order bu the answers are related, protecting science - You need a society in which science is taken seriously, and anyone assaulting it has to provide the goods or get exiled to a desert island somewhere. It also has to be a somewhat pluralistic society so that the fruits of science can be properly discussed. For example, precisely what to do about AGW is a political/ engineering issue. We could go all out for nukes, or we could concentrate more on renewables and DC power transfer cables. Science isn't bothered either way. Protecting science and society takes robust scientific institutions. This does of course have drawbacks, in terms of increased bureacracy, problems with lack of money and perhaps others. But if you don't have robust scientific institutions, divide and conquer occurs. Scientists have to be able to stand together and agree upon how things are done. Unfortunately the state of play right now can be summarised by the SUnday Mails lying article by David Rose which has been dissected at Deepclimate. The media will put forwards whatever it feels will get it most money by entertaining people. Its a chicken and egg situation precisely as to which came first, although the evidence is that newspapers started dumbing themselves down long before circulation began to fall, at least in the UK. And we know that a lot of people are disconnected from both normal media information sources and politics. Anyway, where was I? Ahh yes. Basically, on a wider social scale, science is on the back foot if not being pushed towards the precipice. If you have to have a "science adventure centre" then you have lost the battle already. Communication channels, well, in theory should be better than ever, except that is not the case. The potential gatekeepers for communication that is the media and publishers, have ratted out on the scientists. The internet allows direct comunication which helps a lot. But until you can get the politicians to listen to scientists not liars, then there's going to be problems. Does "evil" include "myopic and greedy to the point of being indifferent to the plight of other human beings"? If so, then all you need is evil, to corrupt the famous lyric. I think communication is THE challenge right now. "Our side" has to find a way to get the relevant information into the hands and minds of lay people without pointing them to the entire bloody IPCC report. Right now, our side stinks on ice at this. I can just hear the keyboards of the broker and his new Fullerine acolyte clacking their grave concern over Tobis' latest attempt to save us from ourselves. Protecting science from attack and society from a scientific charade will certainly be cast as just another example of climate McCarthyism. I rather hope that they do continue to engage you. It is an indicator that they are taking you seriously. Maybe you will attract the same level of visceral dislike from the professional deny and delay crowd as Joe Romm and Eli. I think that means your message is beginning to jell amd strike a chord. I enjoyed your engagement with Fuller though the trajectory was pretty predictable. To put stuff into context though, in Copenhagen, climategate etc was just a Saudi Arabian advertised curiosity. No real climate negotiator has taken that country seriously for the last twenty years. It might seem more hopeless than it really is inside the USA where the media is so corrupt and inane. The opposition is having a great deal of trouble even imagining what I might be trying to say in this series of postings. Little surprise I suppose. Like much of this blog these articles aren't primarily addressed to them. A bit disappointing though to see David Duff plummet from merely obtuse but heretofore unfailingly polite to the juvenile. Flushed, David, I'm afraid. You'll thank me later. 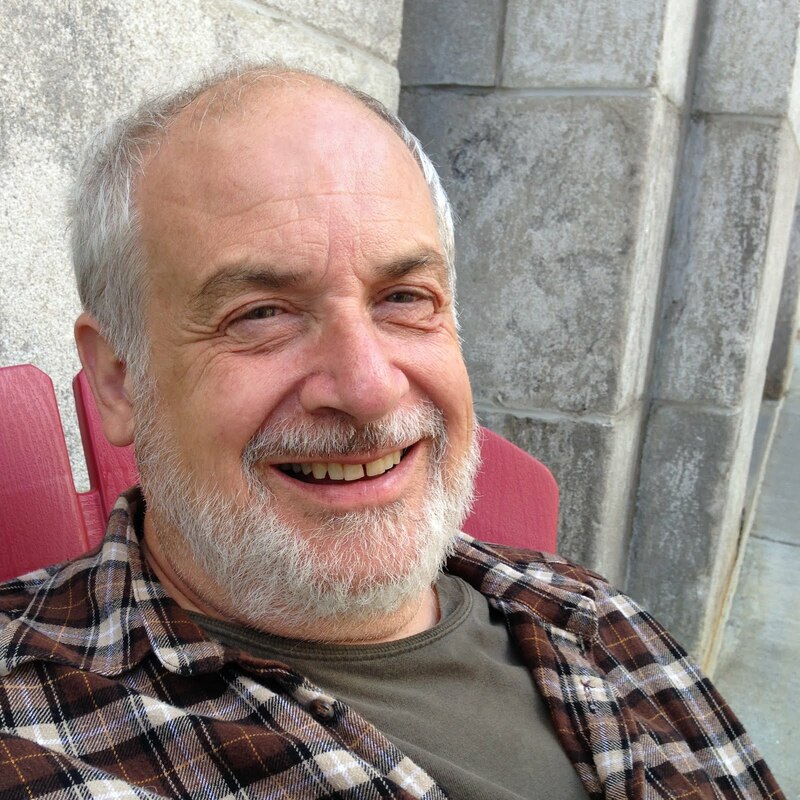 Lou Grinzo - the thing is, from my point of view in the UK, the scientists did a perfectly good job of communication. AGW has been in the mainstream culture for probably a decade now, and subscribers to New Scientist will have known about it since the early 1990's. I definitely recall reading about it when still at school, although I didn't understand the science then. Knowing what the figures are on % of people who agree men landed on the moon, agree about evolution and think that aliens have landed on earth, it is clear that we don't need to persuade that many people about AGW. And last I saw, we had the majority on our side. Yes, thats right, we have in fact won. I also think it impossible to persuade the majority of the population to take enough interest in this topic to be sufficiently knowledgeable to properly take part. Its just too big and complex. Which is why we have things like representative democracies and panels of experts. And the experts agree. But the politics are against us. Hmmm, there aught to be more to this but I've run out of neurons. As a layperson and sometimes handyman I can say with confidence that anything behind the light switch is effectively magic for most people. I would include in that most people with college degrees. When it appears the wizards, er, scientists, are arguing among themselves and the deniers turn to the audience and say "those people are going to take your cars and air conditioning" the tiny little crack available to listen to reasoned arguments shuts in a large chunk of listeners. Only one side of this sham debate is paying attention to why people believe what they believe and how it can be manipulated; it isn't the climate scientists. Repeating the truth is only marginally useful. It's past time to enlist the help of marketing experts of your own. We are playing chess with Dr. Doom; it's important to recognize the pawns for what they are, and for how they're deployed. At my age, Michael, I am only too pleased to be regarded as juvenile. Come on, where's your sense of humour? You are being a tad over-dramatic with this one. Can you please name a few of the 'people with Ph.D.'s who have spent more than 6 months full time equivalent on the subject' and who inhabit the bump on the left? I'm finding it hard to believe that they are more numerous than the PhDs in the drastic, near-zero slump labelled with the text 'Frequently cited "contrarian scientists"'. From the Columbia Journalism Review this piece pointing out that TV weathermen are the main source of information on the climate change for the general public, and the weathermen mostly have it wrong. Oh yeah, and google EXXON SECRETS to find out about the links between those guys (generic) and the think tanks. Paul, Eli is simply roadkill. Joe Romm is a serious threat almost at the level of Gore. It is a scandal the way that climate bloggers on our side have contributed to the campaign to denigrate Gore and the same thing is happening with Romm. If there are things, styles you don't like, disagree with there are ways of constructively dealing with them. "But then I know almost nothing about US right-wing think-tanks." Vinny, I think you have just unwittingly described the problem. As I said before, and I'll say again, we need to learn more about not just the climate, we also need to learn more about the climate inactivist movement. bi, Vinny is quibbling with the exact shape of the graph. Vinny, how close the minimum between the two humps is to zero, and how close Lindzen, etc are to that minimum, are legitimately at issue. I don't propose to get to defending the sketch to that level of detail; that would be like taking H H Lamb's sketch of warm and cool periods from FAR as an instrumaentally based record to "prove" a global MWP. Nobody would do anything like that, right? Vinny, you are probably right in your criticism. All I'll say right now is that that isn't the main point here, and that the graph is intended purely as schematic. But you draw important conclusions from this two-humped motte-and-bailey schematic. You even wonder whether a clustered rather than continuous plot is evidence of evil. It's a bit more than a quibble to question the reality, schematic or otherwise, of the two-humpedness. If informed opinion extends in one big hump from 'Slight Benefit' to 'Catastrophe' and beyond then pop goes the evil. There are no horrible hairy orcs besieging the virtuous truth-seekers up on the motte. There's just the usual spread of informed opinion - a bit daffy at both ends with a big dollop of plausibility in the middle (wherever that is). The horizontal axis is not well-defined so the exact shape of the graph is not well-defined. The distortion portrayed by the graph can exist even if on one or another formal metric of risk the bimodality is smeared out. There are definitely two clusters expressed as follows: people who would feel comfortable attending and/or presenting at a Heartland Institute conference (left hump) and people who would not (right hump). Alternatively, people who feel comfortable citing IPCC WGI as an authoritative source (right), and people who do not (left). People who believe the AAAS, AMS, AGU, APS Royal Society and other national academies, etc, position is sound (right) and people who think it these are somehow corrupt (left). The graphic primarily expresses something about how the left hump plays the press and causes public misunderstanding. The purpose of my present article is to suggest that this playing of the press and the public is the reason for the existence of the right hump. It isn't coincidental. It is cultivated confusion. My conclusion that it can't be an ordinary scientific controversy is not based on or dependent on the visible separation of the risk spectra or the illustrated bimodality. Even in that case, for instance, if the group on the left is so small as to be buried in the tail of the larger group. I assert a sharp distinction between people willing to cooperate with the Heartland Institute, Singers's NIPCC, etc. and people who would not do so. That is because the group with the tighter spread in perceived risk is the group with a far less coherent theoretical basis. The shape of the schematic depends very much on your selection criteria for "informed opinion" and the exact definition of the horizontal axis, which is very vague. Perhaps the exact metric that would produce a bimodal distribution doesn't exist. But that doesn't imply there isn't a sharp distinction between consensus climate science and anti-consensus climate science. Nor does it mean that the anti-consensus group has the intellectual coherence of the consensus group. I contend that some part of the anti-consensus group deliberately sows confusion, misinformation, and doubt about the achievements of climate science to date. I think it is very difficult to separate out the perpetrators from the victims from the people who succeed in fooling themselves. It's very easy to distinguish between what they do and real science, though, in their argumentation techniques. There are very few if any real Augustineans in the left hump. That's the short version of all this. The left hump replaces science with contention. The mainstream is caught in a bind; we can neither contend nor refrain from contending. In the end our only hope is to be able to focus some public attention on the fundamentally unscientific nature of the challenge. This is difficult because the public doesn't understand the difference between Augustinean and Manichean debate. The companies appealed, arguing that they weren't responsible for statements by industry groups like the Tobacco Institute in the 1970s and 1980s that scientific research was still inconclusive about the health risks of smoking. A state appeals court upheld the verdict in October, saying Philip Morris and R.J. Reynolds were among a small group of companies that funded and bankrolled the industry groups and influenced their research. The companies never contradicted the trade groups' "false or misleading statements" and engaged in their own "campaign of deception" during the same period to keep smokers addicted, the court said. The state's high court unanimously denied review of the companies' appeal Wednesday. The case is Whiteley vs. R.J. Reynolds, S178178. "Can you please name a few of the 'people with Ph.D.'s who have spent more than 6 months full time equivalent on the subject' and who inhabit the bump on the left?" "If informed opinion extends in one big hump from 'Slight Benefit' to 'Catastrophe' and beyond"
Vinny, you're asking one question and then later pretending that you asked a different question. "There's just the usual spread of informed opinion"
So you're saying that, you don't know -- and don't want to know -- that the Heartland Institute propagates Rush Limbaugh's ACORN conspiracy theories and thinks that Free Software is a Marxist plot, therefore by ignoring this information, you conclude that it's possible that the global warming 'debate' is a result of "informed opinion". Ahem. The think-tanks have certainly tried very hard to use words to portray themselves as 'the general public sentiment', even as they're actively pumping out this 'general public sentiment' in the first place. This is helped, no doubt, by journalists (whom I've named before) who are totally willing to report on the PR stunts of the American Petroleum Institute, but will avoid even touching on any group that may be described as 'right-wing' or 'free-market' or whatever (because criticizing such a group may alienate ideologues (oh noes!)). "But then I know almost nothing about US right-wing think-tanks." Let this be a meme. "I contend that some part of the anti-consensus group deliberately sows confusion, misinformation, and doubt about the achievements of climate science to date. I think it is very difficult to separate out the perpetrators from the victims from the people who succeed in fooling themselves. It's very easy to distinguish between what they do and real science, though, in their argumentation techniques." Is there anyone on here who seriously does not believe this statement? There is also a loud and vocal group of uninformed mops who get their information from denialist websites such as CA and WUWT, and read lying newspapers such as the Mail and Torygraph. They are the foot soldiers for the puppetmasters Michael refers to. They most definitely exist, does anyone doubt that? Re planning for Texas needs--well, what do you think? "The "best response" according to Sunstein [yes that one] and Vermeule is for the government to "cognitively infiltrate" all the groups of people who believe any conspiracy theories - for example the "extremist group" of 200 million of the U.S. global warming skeptics. Government should take over their lives, "enlist independent groups to supply rebuttals" (I am sure that Real Climate and others have already been enlisted haha), and do many other things that guarantee that only state-sponsored propaganda may be printed in the newspapers or shown on TV." George Orwell would have spotted them at a hundred yards! David, the only thing I have ever said about Sunstein is less than favorable. So on what twisted theory am I expected to be responsible for what he says? Ironically, that would appear to be a conspiracy theory wherein everybody who takes climate change seriously is a member of a club with a far-reaching agenda. That is, a conspiracy theory. Since I do not conspire with Sunstein, I feel no obligation to defend what he has written. I am however interested in the question of conspiracy theories as a phenomenon, so I appreciate the link and will read it. I do not think the use of the word "infiltrate" in a political theory abstract is in itself scary, but that being as it may, it surely doesn't qualify as Orwellian, does it? I mean, "The political manipulation of language, by obfuscation, e.g. WAR IS PEACE. Using language to obfuscate meaning or to reduce and eliminate ideas and their meanings that are deemed dangerous to its authority." per wikipedia. Big Brother would find a less alarming word than "infiltrate" don't you think? But you raise an important point and another key to the fundamental misunderstanding of climate science so common and alarming, especially in the English-speaking countries. There's definitely one thing belonging to David Duff that's being infiltrated, and that is his ideology. Let's remember again what Vinny Burgoo said: "But then I know almost nothing about US right-wing think-tanks." Normally, the response to knowing nothing about a topic is to find out about it. But Vinny Burgoo and David Duff aren't going to do that, because they want to know nothing about right-wing think-tanks and their shenanigans. Every new bit of knowledge is seen as a threat to their 'freedom', I mean their ideology. I am far from writing off Vinny, bi, and he has not tipped off anything about his ideology. He seems an intelligent person who is trying to get a sense of things from the point of view of science. Perhaps the only thing everybody agrees on is that the real balance of evidence is buried under a lot of noise. David is turning stubborn and sour under the influence of the ridiculous gategate, but we should be aware that there are people who are being influenced that way, and not kid ourselves that this propaganda push has failed. I have little doubt that David believes what he is saying, hopelessly wrong though it might be. Let's not tick people off for no reason, particularly people willing to participate here. Your comment is far closer to being moderated out than anything Vinny has said. I appreciate much of what you do, and the question of ethics is very much on topic here, so you squeak by this time, but I have to say I didn't like it. You can do what you like on your own blog but around here the benefit of the doubt is the rule. I stipulate that Marc Morano and Fred Singer are quite apparently evil, though likely operating within the law. If you need a bad guy for discussion here, pick one of those. Everybody else is presumed at worst an innocent victim for the purposes of this blog. RP Sr and Pat Michaels are worthless hacks who think they are clever. Lindzen and Dyson are victims of their own arrogance. The explanation of McIntyre is complicated but of the same ilk as Lindzen and Dyson; I am not convinced that his intent is malign, though it is definitely Manichean. Even Inhofe gets the benefit of a "probably a buffoon" rating from me. That is about the opposition and leaves aside the press. I am still waiting for Revkin to change his spots now that he isn't under the thumb of the NYTimes, so far in vain. It really appears he doesn't understand how much damage he has done. Anyway, let me tighten up the rules. I stipulate that there is evil at work but I do not want to use this blog to spend effort attaching evil intent to specific people. "Let's not tick people off for no reason, particularly people willing to participate here." Well, MT, whatever floats your boat. However I beg to differ on your proposed standard of allowing comments from anyone unless you're satisfied that he's actively trying to do bad things. I think one needs to balance the worry of "ticking people off" against the worry that someone will be influenced by the sheer amount of inactivist noise your blog has decided to let through, and David Duff has definitely been creating a fair amount of noise lately. Oh well. Your blog, your rules. I like the image a lot, because it shows we are still doing “science by vote”. Science by vote did not get the right answer in high school physics, and it does not get THE correct answer on Mother Nature’s “Climate Change Exam”. The correct answer is a very narrow spike, far to the right of the domain displayed. Only a few hedgehogs have done the calcs themselves and know the real answer, so the spike for the correct answer is not very high. It is not even on the radar screen of mainstream scientists. Frank, I am often astonished at what garbage Eli lets through. I wonder why you're on my case and not his. It's absolutely crucial, in my opinion, to understand that just because someone disagrees with you is not enough to make them a bad person. There are psychopaths in the world, and our opposition is influenced by some of them, but not everybody who opposes is is malign or delusional. Winning the most adamant and prolific of those people back in large numbers is not going to happen, of course. Duff appears to be a lost cause now, since he has been swept up in the CRU paranoia, that says we are bad guys because we disapprove of garbage papers in journals, and the papers aren't garbage, because they are in the journals, and so the conspiracy is proven and there is no warming. I guess. I still think Duff is a decent fellow at heart, and so I don't propose to stop trying, though I wish he would actually think a little bit harder. Aaron, it would be immensely convenient if there were a spike on the right; it would make us the centrists again; it might even move the press back onto the actual center and away from their insane skew. I don't think there's any coherence to your position either, though. You're welcome to point us to actual evidence, but just raw assertions of your gut feeling don't count for much. "Frank, I am often astonished at what garbage Eli lets through. I wonder why you're on my case and not his." I'll say, it's quite garbagey, but there's not a lot of garbage. "just because someone disagrees with you is not enough to make them a bad person." As I said, and I'll say this again, yes, I know that, and just because someone isn't outright they can't have a bad effect on any lurkers who visit this blog. And lurkers do exist. Are you proposing that we should just let David Duff's nonsense continue to influence all the lurkers out there, simply because we hope we may save one David Duff from his own (un)thinking? Well, Michael, I might be juvenile, and stubborn, and sour, and wrong - but I've just left a comment on Bi's blog. It was only "hello" but still, you've got to admit it, the kid's got guts! "The purpose of my present article is to suggest that this playing of the press and the public is the reason for the existence of the right hump. It isn't coincidental. It is cultivated confusion." The dyslexia is really going nuts this week! Second time I know about. I meant the left hump. Thanks to a loyal reader! This proposed even-righter hump has an even tighter spread of risk - we're doomed! - than the left hump. Its theoretical basis - we're doomed! - is more coherent than the even-righter hump's but it's based on an equally tendentious reading of the science. Are there any real Augustineans in this even-righter hump? Yes. But so there are in the left. Is this even-righter hump 'fundamentally unscientific'? It's worse than that. It raises an unscientific (mis)understanding of science to godhood. Rush Limbaugh? You appear to have misundersood MT's schematic. 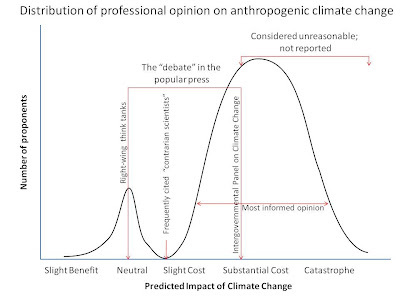 It is intended as a graph of climatologically informed opinion. Rush Limbaugh doesn't feature. "Yes. But so there are in the left. Is this even-righter hump 'fundamentally unscientific'? It's worse than that. It raises an unscientific (mis)understanding of science to godhood." I have no perception of the even-righter-hump among professionals in the field. It may exist in other countries. I think Lovelock is sufficiently sui generis to leave out of the discussion, though I would expect to get much greater pleasure and learning out of a scientific debate against him, vs against Singer, say. Even stipulating a right hump might exist, I don't think the mass media in any English speaking country acknowledges it, I don't think it has organized funding comparable to the left hump, and I don't think it matters to any argument I have made here. Vinny, I agree that the graph could be reconfigured to better reflect reality (and I'd be willing to put some thought into this if there's a chance that Michael would use it). That said, your specifics are mostly off the rails. Part of the problem is that people fling around terms like catastrophe without defining what they mean. I think everyone agrees e.g. that what just happened in Haiti is a catastrophe. Do the organizations you list and the bulk of climate scientists agree that BAU climate change by itself likely will produce similar-scale events by the end of the century? Yes, probably. Do they agree that if we do nothing in the coming decades that the severity of the problem will be greatly enhanced, possibly later in the century but certainly soon after that? Yes, probably. Beyond that I don't think you'll find a lot of agreement since so much depends on the human response to those events. You'll also find agreement that the climate system is capable of responding in a way that makes multiple Haiti-scale events (which likely would be largely drought-induced) look like a walk in the park, e.g. major excursions in Arctic carbon loss (leading to an immediate nasty temperature spike)and/or ocean acidifcation, both of which are associated with extinction events in the geologic record. Speaking for myself, I think an extinction or near-extinction event for humans is plausible, not because of the direct effects of climate change but because of our response to it, specifically widespread warfare aimed directly at mass population reduction. I think history demonstrates that humans are quite capable of such a thing given the means and sufficient stress. IMHO we should be rather desperate to avoid such circumstances. Anyone is free to redo the schematic, though I'd appreciate credit/blame for the idea. Of course, there have been many attempts to actually quantify professional opinion, including an effort I have been helping Schneider, Mastandrea and Baer with in a small way. It turns out to be surprisingly difficult to ask a question that is really clear enough that you are measuring the same thing across respondents without being so legalistic as to chase off most of your intended participants. All I was originally trying to do was make a point about the press. Here I was examining the nature of the left hump. I think it's important not to take this thing too far. It's an impression, not data. I was thinking in terms of keeping it on a conceptual level, Michael. One change I would make is to eliminate the distiction between think-tankers and contrarian scientists, since it doesn't seem useful if you consider both to be professionals for purposes of the schematic. Speaking of which, just so I'm clear, do you consider people like Singer, Plimer or G+T to be professionals? What about McIntyre (no relevant degree or work experience) or George Taylor (no PhD and only marginally relvant work experience)? The difficulty is that all of these people (exception of G+T, perhaps because of the language barrier) have been presented as "experts" in the press. Maybe it would be useful to distinguish the two general groupings (contrarian experts and pseudo-experts) within a single hump, maybe using shading to indicate the perponderance of the latter. One other thought is that the two humps should probably be separate curves with a significant overlap in the vicinity of no-to-low impact.